Welcome to my Garden Romp Crochet Along 2017 Part 5! I can't believe it's been a month already since we started. There's so many lovely colours and people all over the world hook'n along. For this week's Garden Romp Crochet Along 2017 Part 5 you have the choice to add Butterflies or Dragonflies. I can't wait to see which ones you choose for your afghan. I've had a few people ask me what a "Garden Romp" is and it makes me giggle. There was a show I use to watch growing up called The Romper Room and there was a bee named Dewbee. When I was in school a friend gave me this nickname, she said I reminded her of the Bee. 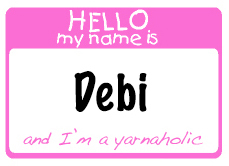 Maybe because my name Debi means "The Bee". When I finished my first afghan I grabbed one of my original bee patches I ordered from Mommy Made It on Etsy. The little bee in the garden, stuck in the mud making it's way to the clouds reminded me of my nickname and the Romper Room, Debi's (the bee's) Garden Romp. Let's get started on part 5! Garden Romp Crochet Along 2017 Part 5..
For the next section choose to work Butterflies or Dragonflies..
Garden Romp Crochet Along 2017 Part 5 Video Tutorial..
Have you made your own Garden Romp Crochet Along 2017 Part 5? "Hook Up" on Ravelry and share your pictures, I can't wait to see!